The Good: This recipe is very low in total calories, cholesterol and sugar. It is high in fiber and lean protein. The Bad: Over 60% of the total calories in this recipes comes from fat, and some of it is saturated fat. Preheat oven to 350°F. Scatter pita pieces on large rimmed baking sheet. Sprinkle with salt. Bake until crisp, 15 minutes; cool. 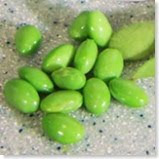 Cook edamame in large saucepan of boiling salted water until tender, 5 minutes. Drain, reserving 3/4 cup cooking liquid. Place edamame, oil, and 1/4 cup reserved cooking liquid in processor. Blend until smooth, drizzling in 1/4 cup cooking liquid and lemon juice. Season dip with salt and pepper. Blend in more cooking liquid by tablespoonfuls if too thick. Add minced basil; pulse until basil is just mixed in (do not puree). Transfer dip to bowl. Garnish dip with basil sprigs; serve with pita chips. 0 Response to "Recipe: Edamame Dip w/ Pita Chips"